I keep hoping for a perfect guilt-free baked good, but there's always a price to pay -- in taste, in buttery softness, in the quality of ingredients. That said, I'm pretty happy with this healthier scone recipe. It uses two types of wheat flour to get most of the benefits of wheat with relatively little cost in terms of texture. They're quick to prepare, making them a great after-school snack, and they hold up well in a lunchbox. 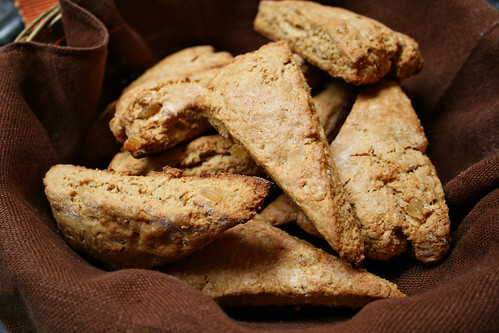 Kids have had mixed reactions to the zip of candied ginger in these scones. My older son suggested they would be better with icing on top, then proceeded to eat three small scones -- no icing -- one day and two more the next. Then a girl with a crush on him told him they were too spicy, and now he doesn't like them any more. I'll try dried currants or cranberries next time. I like these with uncrystallized candied ginger (I found some at Trader Joe’s). You can easily substitute other dried fruits: currants, blueberries, raisins, apricots, dates. Combine flours, baking powder, baking soda, salt, nutmeg, and sugar in the work bowl of a food processor and pulse briefly to combine. Add butter chunks and pulse until mixture resembles coarse crumbs. (Alternatively, combine dry ingredients in a bowl and cut in butter using two knives or a pastry blender.) Sprinkle in ginger, being sure to separate any clumps, and stir in lemon zest. In a small bowl, whisk together egg and milk. Pour blended eggs and milk into flour mixture and stir just until moist. Don’t overmix! Turn dough onto a lightly floured surface and knead, briefly and gently, just until mixture comes together. Put dough in floured bowl, cover with a kitchen towel, and refrigerate for 15 minutes. Again, turn dough onto lightly floured surface and gently pat into a circle about 1 inch high. Cut into 8 or 12 wedges, and set wedges onto prepared baking sheet. Lightly brush tops with milk. Bake 15 minutes or until golden brown. Remove to wire rack to cool. Yum! 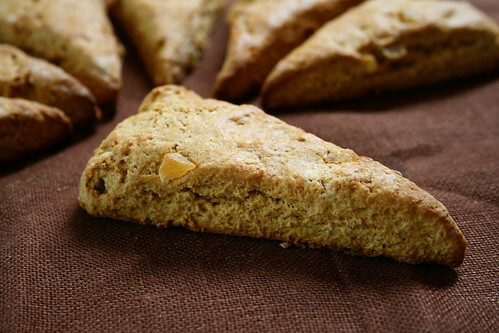 I'm a fan of crystalized ginger and I bet it pairs beautifully in this scone. Thanks for sharing!